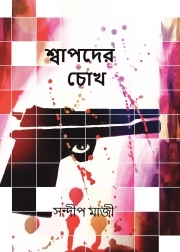 Description of "SWAPODER CHOKH (শ্বাপদের চোখ)"
This is a collection of short detective stories. All the stories were previously published in different print and web magazines. Sandip Maji, born in 1984, is working as an Electrical Engineer. He started writing during school days. Now Sandip is a regular pen in webmags and little mags. Reviews of "SWAPODER CHOKH (শ্বাপদের চোখ)"